According to a news article at the beginning of this year, the price of gold rose by 30 per cent in 2010, marking the tenth straight year of rising prices for the precious metal. Although gold prices have fallen of late, just over 5 per cent in 2011 as of this past Friday, there remain many who are convinced that its future remains bright thanks to continuing uncertainty and some hidden economic and demographic time bombs that most seem happy to be oblivious too. One day in the not too distant future gold prices of $1,300 per ounce may be considered an absolute steal. 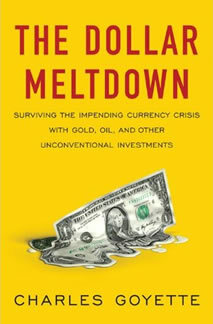 Charles Goyette is among those ranks as The Dollar Meltdown: Surviving the Impending Currency Crisis with Gold, Oil, and Other Unconventional Investments clearly indicates. Originally published in 2009 and re-released in paperback at the end of last year, Goyette's book makes the case that the end-times for the American economy is near and everyone needs to look elsewhere if they intend to create an investment strategy to survive the country's decline. Goyette begins his effort with a sobering overview of where America's government stands with its spending, debt and future obligations. The numbers aren't new for anyone who's paid any attention but the size of figures like unfunded liabilities – as much as $100 trillion dollars – should be enough stagger even the most uninformed reader. From there Goyette argues that the current crisis is the result of the federal government's move from the gold standard, gaming inflation as part of its economic policies and debasing the dollar by printing new ones as needed. As uncomfortable as these pages are to read, it is when Goyette moves into likely scenarios for America's collapse that The Dollar Meltdown begins to take on an air of ghastly inevitability. As debt ratio explodes and the federal government and its instruments become increasingly discredited around the world, many its obligations to Americans will be repudiated. Words like deflation or stagflation will reappear from history textbooks or Americans will experience the horrors of hyperinflation. The U.S. dollar will be dumped by foreign governments and with a full-scale monetary breakdown, the federal government will likely attempt hopeless wage and price controls, confiscation and currency controls. So what is an American to do? Goyette argues that old standbys like gold and silver – preferably with the investor physically holding their assets – will at least ameliorate some of the worst what he believes is to come. He also counsels investments in oil and agricultural – two things everyone will need regardless of the state of the economy – and some bond funds designed to take advantage of bear markets. Perhaps not surprisingly given his low opinion of the U.S. dollar, Goyette also lists several foreign currencies which could pay off for investors as dollar flight takes hold. It's hard to ignore that The Dollar Meltdown is part ideological argument, part investment guide, which might weaken its effect for some readers. And while Goyette's libertarian views of government are clearly on display, it is difficult to dispute his contention that that the U.S. is enormously indebted, the dollar is increasingly losing worth, the federal government is gaming the economy, other nations will eventually stop feeding the monster and there will be consequences. Only the ignorant, the irrational or those counting on a collapse to further their own agenda would argue that some sort of reckoning is coming. Whether Goyette's investment prescriptions will help average Americans salvage something out of a collapse is something that can only be judged ex post facto. Even if one chooses to ignore the second half of The Dollar Meltdown, however, it is a first-rate history of money, government economic intrusion, the consequences of debasing a nation's currency and how the U.S. has backed itself into a not easily escapable corner. With efforts like Goyette's no American today has the right to argue they don't know where the nation is heading and how the road there was paved. What remains to be seen is how badly the fall will be and whether Rome can be rebuilt. Steven Martinovich is the editor in chief of Enter Stage Right.